The collection consists of records of the provincial office of the Cooperative Commonwealth Federation and general research material pertaining to socialism and the labour movement. It consists of minutes, scrapbooks, office correspondence and files relating to party organization and records of committees, CCF clubs, constituencies, federal ridings and election. The collection also includes records generated by Arthur Turner as CCF Whip and Arnold Webster as a provincial party leader. Subject files pertaining to early socialists and clippings about international affairs were created by Dorothy Steeves. Subsequent accessions added to the collection have included the records of Angus MacInnis, Francis McKenzie and former provincial leader Ernest Winch. 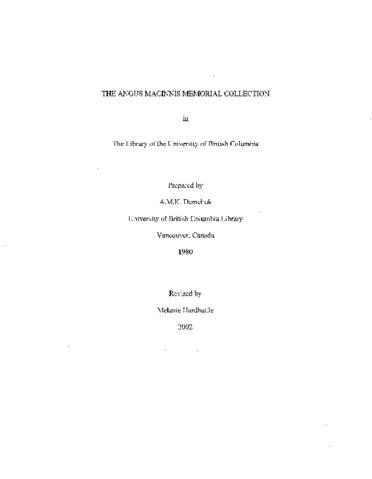 Three fonds were originally set up as subfonds within the Angus MacInnis memorial collection: Angus MacInnis fonds, Ernest E. Winch fonds, and Francis J. McKenzie fonds. While they are physically part of the Angus MacInnis memorial collection, they were processed as standalone fonds and have separate finding aids.